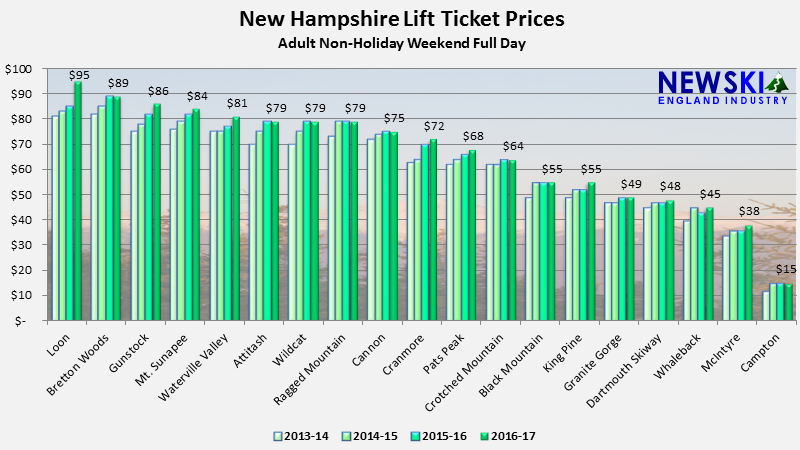 Following the rough 2015-16 winter, New Hampshire adult weekend ticket prices at chairlift served areas are up 3 percent. For the first time in a decade, Loon has surpassed Bretton Woods as the most expensive in the Granite State. Loon's full day lift ticket is now $95, a whopping 12% increase over last season's non-holiday weekend day rate. Bretton Woods held their rate at $89. 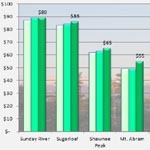 Waterville Valley, the only ski area significantly expanding its skiable terrain, increased its rate by $4 to $81 (5%). Campton Mountain remains the cheapest chairlift served ski area in the state at $15. Tenney Mountain is planning to reopen in late December, but has not announced its rates. The 2016-17 statewide mean is $66.11 per adult non-holiday weekend full day lift ticket, a 3% increase over 2015-16. The median price is $72.00, also a 3% increase. The 2015-16 mean was $64.42 (3% increase over 2014-15) and median $70.00 (9% increase over 2014-15).